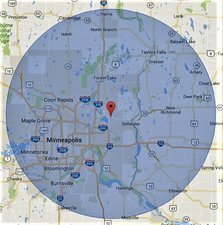 Our Service Area — Pinnacle Inspections, Inc. Included in our standard pricing, Pinnacle will travel up to 40 miles from our office in Washington County for an Inspection or Inspection with Radon Testing, OR up to 20 miles for Radon Testing only. We are happy to travel further for our clients, but a nominal fee is added per mile for each trip. We have inspected homes from Mora to Northfield, and Mound, MN to River Falls, Wisconsin. 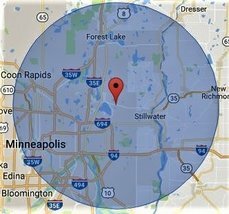 Please click on the maps to get a better idea of our service area, but remember that these are circumference maps and is only a approximate.